Imagine a box densely packed with balls. The spacing between the balls is filled with a fluid of viscosity similar to honey. The box has many copies of eight types of balls that have different surface properties and colors. One type of ball is special: it is coated with multiple copies of an adhesin that can bind with any of the other balls or with a solid surface. This special ball also has a motor that propels the adhesin along its surface. As a result, this ball can move actively on either the internal surface of the box or over other balls. We take such a box, mix the contents, and pour them onto a plane surface. Given sufficient time, the balls with the active adhesin stick to all seven types of balls, and to the plane surface. The balls with the active adhesin move over the plane surface and carry other non-motile balls as cargo. As a result of collective motion, the balls arrange with specific spatial structures. Such spatial structures can be attributed to the motile and adhesive forces present in the system. In another box, that serves as a control, the special ball does not have active motility. In this control experiment, we find that specific spatial structures do not appear: the distribution of balls is uniform. In the above paragraph, if one replaces the word ‘ball’ with ‘microbe’ then one will find a description of our experiment. The eight microbial species that we use are abundant in polymicrobial biofilms that are a part of the human oral microbiome. 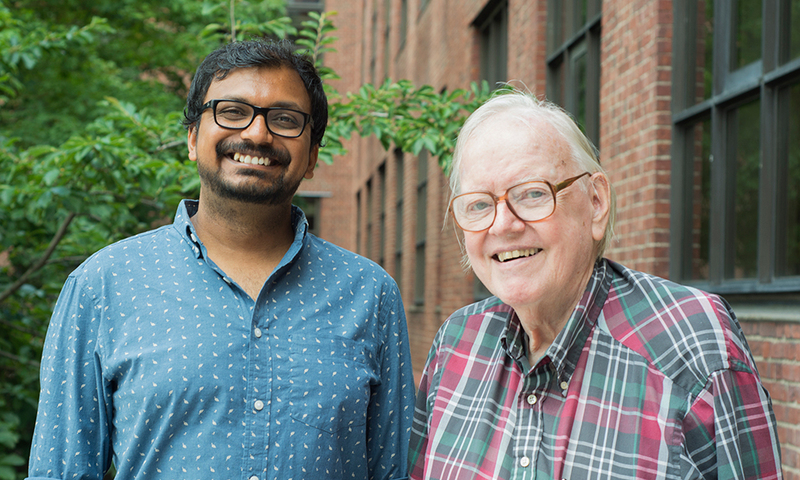 Recent work from the laboratories of Jessica Mark Welch (MBL, Woods Hole) and Gary Borisy (The Forsyth Institute) showed that such biofilms, when isolated from human subjects, have a well-defined structure. To find the architects of the spatial structure of a biofilm, we focused on a microbe of the genus Capnocytophaga that is abundant in biofilms of the human oral microbiome. As we demonstrate, cells of Capnocytophaga move actively over surfaces via a process called gliding motility. Cells of non-motile bacterial species attach to the surface of Capnocytophaga and are propelled as cargo. The cargo cell moves along the length of a Capnocytophaga cell, looping from one pole to the other. 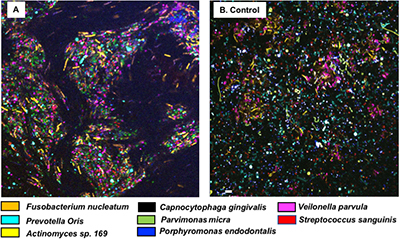 Multi-color fluorescent spectral imaging of cells of seven different live but non-motile bacterial species that are abundant in the human oral microbiome reveals their long-range transport in a polymicrobial community by a swarm of Capnocytophaga. The swarms move in a circular fashion in the 2D plane and are layered on top of one other in 3D space. We find that the synchronized public transportation of non-motile cargo bacteria helps shape a polymicrobial community. (A) A community of bacteria from the human oral microbiome containing seven nonmotile fluorescently labeled microbes organized in islands by the swarm of an eighth species, Capnocytophaga gingivalis. (B) A control in which the experiment of A was repeated with de-energized cells of C. gingivalis.